Can An Electric Car Be a Muscle Car? To the hardened muscle car fan the concept of an electric vehicle being classed in the same category as muscle cars seems an odd proposition. Muscle cars equal huge V8 engines, a distinctive tone, possibly a blower and a heap of attitude. However, the electric vehicle is looking like it is here to stay and one day in the future may just possibly be the only vehicles on the road. If this is the case then we have to plan for future muscle cars being possibly electric powered. Petrol/gas won’t go away entirely. They will be treated like classic vehicles under their own category. This video shows you a stripped out Tesla P100D weighing in at 4,460lbs and being able to blast down the strip silently in record time. You wouldn’t exactly class Tesla at the moment as a muscle car, but some future version electric muscle car by the main muscle manufacturers may just be possible. I wouldn’t be surprised if a hybrid was the first step in this direction, but I cannot see a V8/electric model anytime soon. At the moment comparing gas powered cars to electric is like comparing apples to pears. The outer shell maybe of a similar design, but the powertrains are worlds apart. 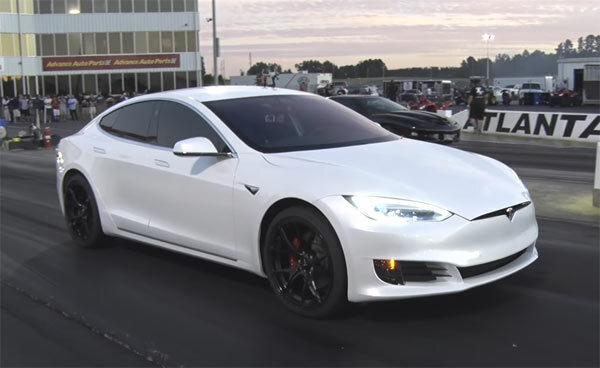 The Tesla in the video is able to do 10.48 seconds at 125 miles per hour then be able to drive home no problem. It’s a regular roadgoing car that has been tweaked and tuned to get the fastest quarter or 8th mile time possible, just like muscle cars. Therefore, it’s entirely possible that in the future gas powered muscle cars will be just one class of vehicle alongside electric. But in any case, we are only at the start of this journey and many years off seeing electric vehicles taking dominance. So, we have many years ahead enjoying the thunderous rumble of a V8 wherever we choose. For now we just need to watch out electric vehicles progress and wait for the day when the first electric muscle car hits the streets and the reception it gets, good or bad. Check out the video below and comment on what you think about these present-day electric vehicles. Related ItemsCan An Electric Car Be a Muscle Car?